The annual HYHK budget of $1.2 million is for the first two years of operation, rising to a maximum of $ 3.0 million after the fifth year, if needed. The Board of Directors adjusts services and programs annually as part of the budgeting process to meet the changing needs of the area. HYHK’s budget is about average for a Manhattan BID and is well suited for this district’s program of services and improvements considering current and future needs. Any contemplation of an increase must be approved by the BID Board of Directors, the NYC Small Business Services and formally voted on at the City Council. The HYHK Planning Committee, under the constraints of the BID Law, proposed an assessment formula that generates sufficient revenue to provide the services desired by the BID area community. 3. “Blended” assessments - one that incorporates the assessed value and the square footage of a property. A “blended” assessment is a fair method in evaluating property as it takes into account a property’s current use, its size, and its financial performance. 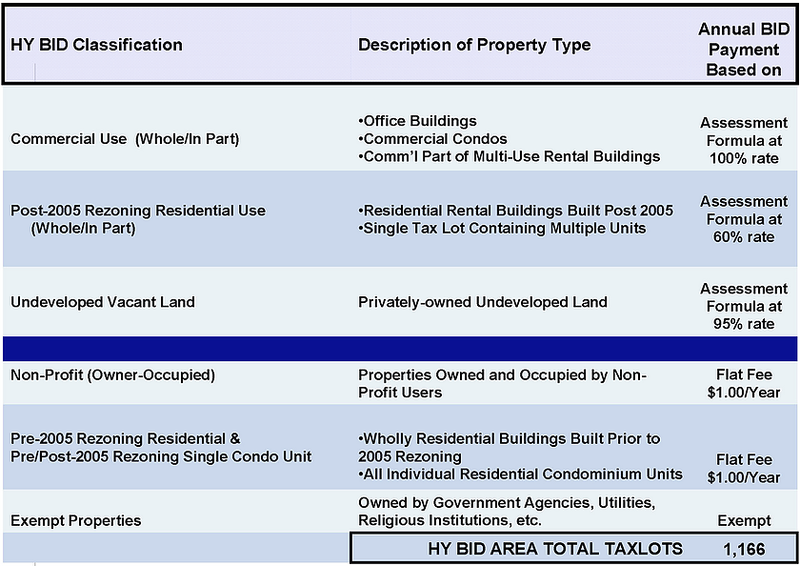 Given that many properties in the HYHK district will be redeveloped in the years ahead, the “blended” assessment will be applied to a broad range of property classes. This flexible structure will ensure that properties pay a fair assessment, no matter what phase of development an owner is in.